Surely this shouldn’t come as too much of a surprise, right? Well okay, maybe not this exact scenario – the idea of DevilDriver releasing a covers album of country songs is empirical proof that the truth is indeed stranger than fiction – but considering how drastically DevilDriver’s profile has shrunk, with most of their recent albums met with incredibly muted response, if any at all, something as wildly out of left field as this was always going to be the primary way to get the masses talking again. So here’s Outlaws ‘Til The End, Vol. 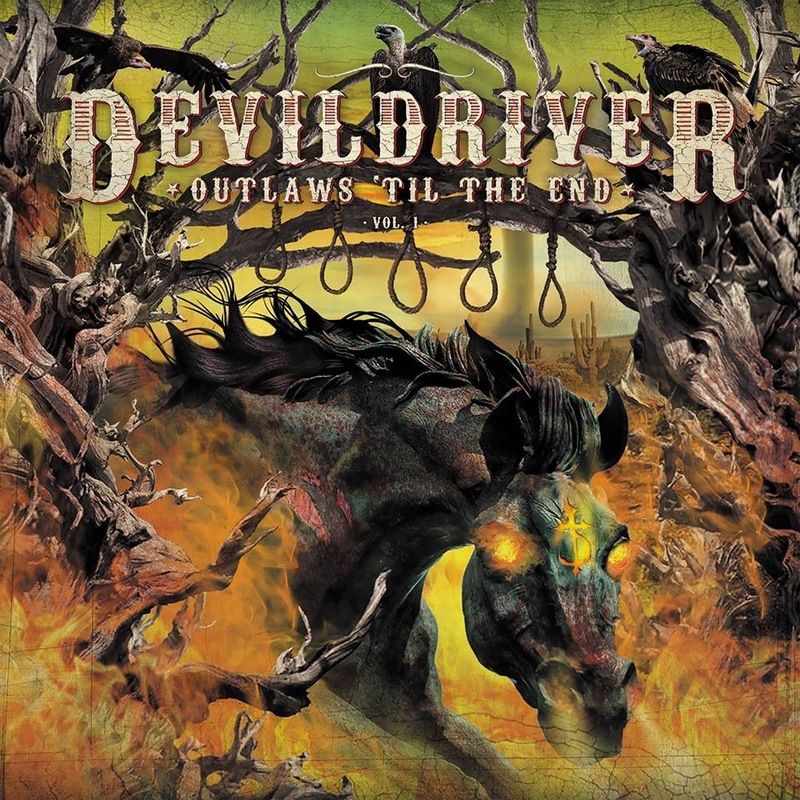 1, in which DevilDriver perform metalled-up versions of their personal favourite outlaw country songs, recruit a whole load of guests to join them, and hope that it all pans out in the end. The funny thing is though, for what’s undoubtedly to be viewed as a stopgap release, Outlaws ‘Til The End, Vol. 1 is probably DevilDriver’s best album in a good few years, not only because it preserves the numerous similarities between metal and outlaw country well, but because it’s a genuinely solid collection of tracks that DevilDriver have managed to transpose and accentuate the metal leanings of with ease. Of course, what that ultimately boils down to is a load of songs sticking rigidly to the down-the-middle melodic death metal that this band have so often made their modus operandi, and it does cause a number of them to fall behind, particularly near the start with Country Heroes and Outlaw Man especially coming over in the same way as a passable DevilDriver song usually would. Saying that, it’s quite surprising how much effort seems to have gone into keeping some southern sizzle in these tracks to keep them distinct, and when there’s the powering grooves of Ghost Riders In The Sky and If Drinkin’ Don’t Kill Me, or Dez Fafara’s throat-ripping vocal trades with 36 Crazyfists’ Brock Lindow on Copperhead Road, it comes to light how readily the two aims of making a more lighthearted listening experience and paying homage to such a formative genre have been met. And of course, that’s also in relation to the guests, both in their locations on the musical map, and how each one contributes to make their respective tracks so much bigger to complement DevilDriver’s own meaty sound, and honestly open it out to make it a bit better. And again, there’s that homage paid to both sides that makes this so concise; Lamb Of God’s Randy Blythe and Mark Morton feel right at home in the chaotic flurries of Whiskey River, but when John Carter Cash and Ann Cristina Cash (son and daughter-in-law of Johnny Cash, for the record) lend their backing to Ghost Riders In The Sky, the solemnity and gravity that offers really does feel excellent. Couple that with DevilDriver’s typically tight, heavy production style, and Outlaws ‘Til The End, Vol. 1 feels like a band getting back on the horse (so to speak) after a few years of struggling to make much of an impression at all. And yes, it’s only a covers album, and yes, these sorts of projects don’t typically seem to last long, but it’s also a lot more entertaining than it has any right to be, and maybe even a catalyst for metal fans to explore country music more extensively. That ultimately remains to be seen, but regardless, there’s no reason that DevilDriver fans shouldn’t give this album their attention. ‘Outlaws ‘Til The End, Vol. 1’ by DevilDriver is out now on Napalm Records.